Records in France go back to at least the 16th century thanks to King Francois 1st who signed the Ordonnance de Villers-Cotterets in 1539, requiring the clergy to keep a register of all baptisms. The church sometimes kept its own records, but at this point it became obligatory. In 1542, the Concile de Trente, added the requirement to record the names of godparents and in 1579 the Ordonnance de Blois, which was signed by Henri III, extended these requirements to include marriages and funerals. 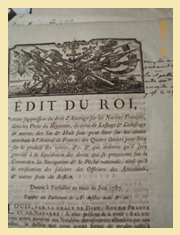 The Edit de Versailles, dated 19 November 1787, called for all catholic priests to enter into their registers the births, marriages and deaths of Jews, Protestants and Atheists. During the French Revolution in 1793 record keeping of l'Etat Civil – the Civil State Records were maintained by the Mairie (Town Hall). The church continued to keep their own records for church purposes. Records in France are not available to the public until they are 100 years old. Our experienced French speaking researchers know the available records well and therefore we can provide a speedy, thorough search.